Compact, totally enclosed digital pressurisation unit with electronic pressure transducer and user-friendly microprocessor for use on sealed systems in order to provide a minimum system pressure requirement. The Midi pressurisation unit should be connected to the system at the same point as the expansion vessel to provide a neutral pressure reading. where standard diaphragm expansion equipment is limited. 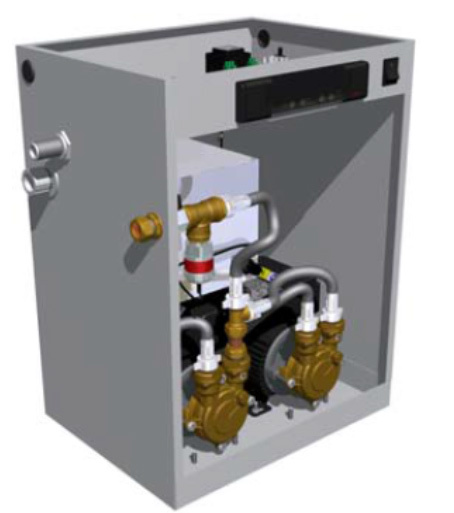 The Europak Flamcomat is a unique product that combines a balanced pressure system with an effective pressure step de-aerator function and an integral top up arrangement utilising an AB airgap. components while monitoring the vessel contents and the system pressure. A common alarm volt free contact is included within the Europak Flamcomat control unit for remote indication of a fault. Remote analogue indication of the vessel contents and system pressure are possible as option extras, as is a date chip for exact system logging. The Europak Flamcomat is designed to accurately balance system pressure to within (typically) 0.2 bar(g). As the system fluid heats up it expands, during expansion the system pressure attempts to rise. 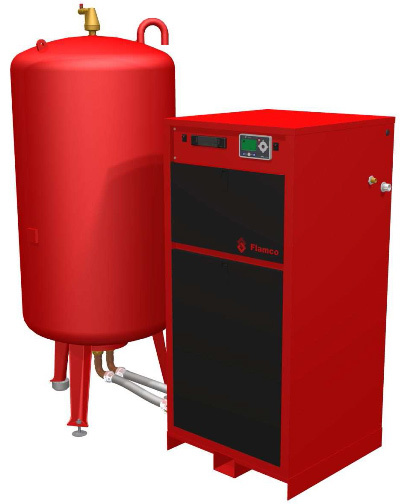 The Europak Flamcomat control equipment senses the pressure rise and opens the connection (solenoid) valve to the expansion vessel. The expanding fluid flows into the vessel, through an orifice (to restrict flow rates) and a system pressure rise is prevented. As the system cools down, the system fluid contracts, during contraction the system pressure attempts to drop. The Europak Flamcomat control equipment senses the pressure drop and energises the pumps. The fluid is actively from the vessel back into the system, and a system pressure drop is prevented.